The right time for trekking is between the months of October, when they open the vehicular road to the Termas de Colina, and May, when closed by the first snowfall. 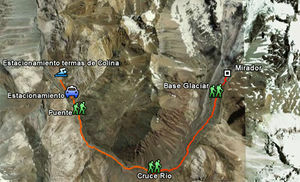 If you want to do in winter, 'walk from Lo Valdes, consider two to three days of walking. From the parking lot located 660 meters east of Bath Hill, at 2450m, you must follow the trail that takes you to Pointed, along the north bank of River Hill. After 15 to 20 minutes from the Baths will reach a bridge to cross the River Hill to its south shore. then be followed by the south bank of the river in an area where the valley is narrow, until he ran into the creek that leads to the inlet of Horses (½ h here). Once across the creek, you come to a plain, often populated by animals. At this point it is at the base of the Pointed. You can see a way of mining exploration in its slope. We must continue east on a plain populated bush. The trail (which is possible to lose in the plain area that follows the creek) is very close to falling into the river precipice. The path is almost clear, but after a while goes back down to a meadow where you can get lost briefly, but reviving it is a matter of instinct. After you cross the Río Azufre (the author of this review, in addition to the waypoint, built a stone pillar at the junction). The crossing should not represent a major complication, but certainly require remove your shoes and your feet freeze. Then, the path a bit lost when the valley begins to turn northeast. On a hillside where a large stone road begins again clear, with good eyesight can see it from afar. Follow the path, but now heading north. 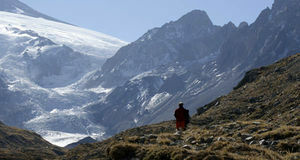 Some time ago that San Jose is visible in the background, with black snow glacier. On the right is visible the line of hills that make up the Yellow, Pan and Manu Tara. After a while, he leaves a beautiful flat valley with a creek in the middle. Trekking: In a normal pace, this trek should take about 3 hours to the base of the glacier and an additional half hour to viewpoint pyramidal weightless for the day. and approximately 5 to 7 hours, weighing, thinking of camping on site, as always, depending on individual conditions of each person. Consider two hours to return. 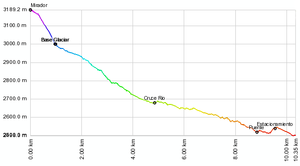 Randonnée: Two and a half days, then must be added a day to go from Lo Valdes Hills and a half baths to return. 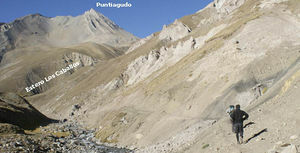 This section is described in Lo Valdes - Termas de Colina. From the moment of opening the road vehicle (usually October) is to pay $ 6,000 per person to enter the baths. 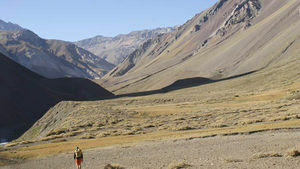 The best format for this trek is from a Friday evening to sleep in the hot springs (about two hours from Santiago) and relax the muscles in the pools overlooking the Andes night. 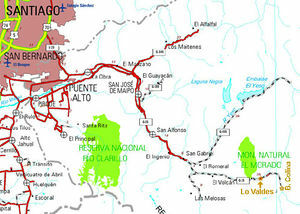 Then from early Saturday, returning to the hot springs to bathe and return to Santiago the same day. Of course it is also possible from a Saturday, but in this case possibly the pools are much more full. There is water all along the way, so it is not necessary to load a lot. The river crossing Sulfur can be sensitive at the time of snowmelt (November to early January), but should not be an impediment to people with no particular aversion to this type of crosses. Full path trekking the Glacier Snow Black. To download the file right-click and then select "Save file as" (IE) or "Save link as" (Firefox, Chrome). By trying to open it directly, some browsers will show the raw code with the coordinates.